João Bénard da Costa: Others Will Love the Things I Have Loved played Saturday, January 9, at Museum of the Moving Image as part of First Look 2016. With the passing of Manoel de Oliveira at the age of 106 last February, 2015 may prove to be a crucial year in the history of Portuguese cinema. The same year saw the release of two masterpieces of Portuguese cinema in U.S. theaters: Pedro Costa’s Horse Money and Miguel Gomes’s Arabian Nights. Neither, of course, was exactly a box-office smash, but their very existence—along with other recent films by Joaquim Pinto, João Pedro Rodrigues, and others—nonetheless serves as a testament to Portuguese cinema’s persistence. It’s a fortitude worthy of Oliveira’s own tirelessness, following a wave of austerity measures that have crippled their country and their cinema along with it. This makes Manuel Mozos’s elegiac essay-portrait João Bénard da Costa: Others Will Love the Things I Have Loved unexpectedly timely—it too concerns Portuguese cinema’s uncanny position between life and death, past and future. Its subject is another recently departed figure: the legendary film scholar, programmer, and longtime head of Cinemateca Portuguesa, João Bénard da Costa, who died in 2009. An intimate and deeply nostalgic portrait of someone who was at the center of film culture in Portugal for nearly half a century, Mozos’s film is also poised between mourning and hopefulness, in the uncertain space of a history not yet fully formed. As its subtitle suggests, the film emphasizes Bénard da Costa’s career in bringing his near-devotional cinephilia, his passionate attachment to “the things I have loved,” to a public audience. “I come to lead you through images and memories of mine,” the film’s epigraph reads, and throughout Mozos follows a similar gesture of pivoting between interior and exterior, between his subject’s most intimate obsessions, memories, and desires and the wider world he inhabited and helped to shape. Bénard da Costa’s recollections and musings—read in husky voiceover by his son João Pedro Bénard—are set against images of those places, people, and objects most significant to him. In an explicitly Proustian mode, the film montages family photographs and home movies with Mozos’s own images of Portugal’s fogbound coastlines, the historic town of Sintra, and the almost mythical hills of Arrábida to Lisbon’s south—creating fragmentary spaces of memory in which past and present constantly interrupt one another. The film’s most significant—and uncanny—spaces, of course, are those that belong to the cinema. These are places both real and virtual: the imaginary cinematic landscapes of treasured films like Carl Dreyer’s Ordet or William Dieterle’s Portrait of Jennie, as well as more material, more public spaces such as the Cinemateca Portuguesa, Cinema São Jorge, and Fundação Calouste Gulbenkian. These are the places most closely associated with Bénard da Costa’s role as the nation’s unofficial ambassador of cinema, and in archival photographs we see him posing at public events with the likes of Lauren Bacall, Catherine Deneuve, and Kirk Douglas—always with a jollity somewhat at odds with the mournful notes of his writings and of Mozos’s film. This disparity of tones suggests a break with the past: these very real spaces are in their own ways fragile, in danger of receding into memory. Just as the mythic landscapes of classical cinema blur with those of Bénard da Costa’s biography—the oneiric coastlines of Joseph Mankiewicz’s The Ghost and Mrs. Muir merging with those of Portugal—so do the images of Lisbon’s theaters seem to hint at a crumbling cultural infrastructure. 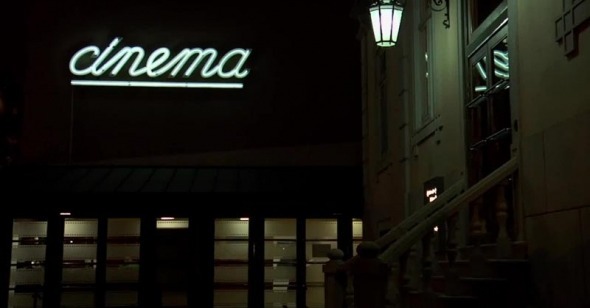 The cinema’s ephemeral nature, it would seem, is contagious: Cinemateca Portuguesa itself almost closed in 2013 due to lack of funds; other spaces, like the Teatro Nacional de São Carlos, are clearly the remnants of a lost era. In this sense, the title of one of Bénard da Costa’s books—1996’s O Cinema Português Nunca Existiu—haunts Mozos’s film. “Portuguese cinema has never existed,” or at least its existence has always been delicate, and indeed it may soon cease to exist. Mozos’s film follows these obsessions with the same wayward attention as Bénard da Costa’s Borgesian prose: elusive and allusive, elegant and melancholy, always in search of a way to explain the inexplicable. In this sense, Mozos seeks out a language to describe cinema’s particular relationship to memory, its status as a space of shared remembrance. “Memories procreate as if they were living people,” Bénard da Costa writes, and there is a sense in these words that cinema itself is an art of memories that reproduce themselves: films proliferate and regenerate in the minds of all who see them. All the more reason to keep them alive, to share their knowledge and passion beyond death.